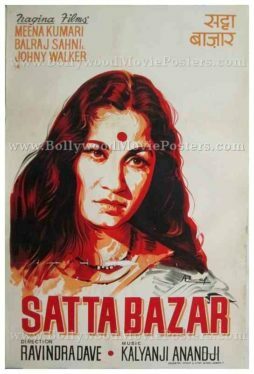 Old Bollywood movie poster of the Hindi film, Satta Bazar (1959) for sale. This is an actual surviving original vintage Bollywood movie poster of the 1959 Hindi film that featured the Tragedy Queen of Bollywood, Meena Kumari in the lead role. This vintage Bollywood movie poster features stunning hand painted artwork. A brilliant hand painted portrait of actress Meena Kumari is set against a plain white background in this minimalist Bollywood poster. Originally hand painted on canvas, the printed signature of the Bollywood poster painter is seen on the bottom right of the poster.